We are also having nominations for board positions. If you are interested in running and haven’t let a board member know yet, feel free to have someone nominate you on September 9! Afterwards, we will have a sew-in! Don’t forget to sign up for Weeks Ringle before then; we will be opening up remaining spots to the public next week. We’ve been given the opportunity to hold a sew-in at the San Diego Quilt Show, which is happening from September 20-22 at the San Diego Convention Center. Show times: Thursday 10am-6pm, Friday 10am-6pm, and Saturday 9am-4pm. You will need to commit to the days (or half days) that you want to come to the sew in, in order to have your space reserved. Sign ups will be open until September 12th. The entrance fee will be waived for the first six people that commit to sewing each day. 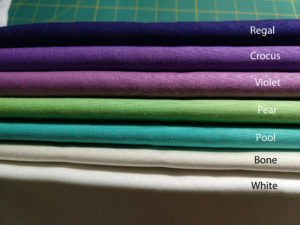 A half day option will be available if you only are able to sew for part of the day. Feel free to bring your own project or to work on blocks for the QuiltCon Charity Quilt project. As part of the sew-in, we’ve been asked to highlight our charity efforts, so we will have information about the charities that we currently support as well as examples of what we’re currently working on for our charity project. We will also be spreading the word about quilting and guilds in general. Chairs, tables, and power will be provided, but you will need to bring any other supplies that you use to sew (machine, iron, ironing surface, cutting tools, ect.). A SDMQG moderator will always be present in the sewing area, so you will be free to go walk around and see the show as well. We are extremely excited to announce that Weeks Ringle will be coming to SDMQG to present her lecture “Transforming Traditions: Modernism and Quilts” on Sunday, October 14th, 2018 at noon. This lecture is free for dues-paying SDMQG members and $10 for guests. Weeks will also teach a workshop on Improvisational Piecing, which she describes below, along with a materials list. The workshop will be held on Saturday, October 13, 2018 from 9am-4pm at Quilt in a Day, San Marcos. Pay using Venmo (@sdmodernquiltguild), PayPal (jill@leinenweber.com), cash or check to any board member. We will hold spots for those paying non-electronically only until Sunday, September 9th. After that, your spot will be given to the next person in line. We will be opening this workshop to people outside SDMQG, pending availability, on September 9th. 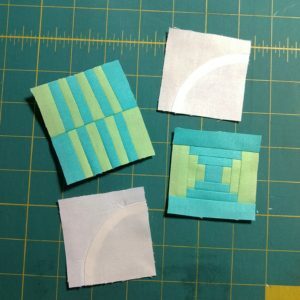 Learn different techniques for improvisational piecing and choose one to develop a new project. We’ll guide you through a strategy that will have you making design decisions as you go. Students can begin making ourCall Me Crazy or Just Passing Through quilt or a project of their choice if they already have something in mind. Our patterns and magazines all ship for free to US destinations, so please order in advance to make sure you have what you need for class. Student supplies needed: sewing machine, rotary cutting equipment, an assortment of cotton quilting fabric with different values and hues (small-scale prints, tone-on-tone prints and solids work well; avoid large-scale fabrics), extension cord, thread, seam ripper, notebook or journal, and any supplies you like to have handy when quilting. If students wish to make the Call Me Crazy quilt with their own fabrics, they will need 2 3/4 yards white or other field fabric, 2 1/2 yards total assorted blue (or other color) fabrics and 3/4 yards binding fabric. If students wish to make the Just Passing Through quilt with their own fabrics, they will need 3 3/4 yards solid field fabric and 1 1/2 yards contrasting solid fabric for the splicing and binding fabric. Weeks Ringle is coming to SDMQG! We are pleased to announce that Weeks Ringle has confirmed that she will come to SDMQG. She will present a lecture on Sunday, October 14th at noon. Cost is free to SDMQG members and $10 for guests. We are still discussing which workshop she will present, but save the date for October 13th from 9-4pm at QIAD. In case you haven’t heard, this upcoming QuiltCon’s Charity Challenge theme is to use small piecing. While the whole quilt does not need to be made up of all small pieced blocks, it should be the main focus. For more information about the challenge, check out the QuiltCon website. We have planned out the guild’s quilt for this challenge and are raising our own challenge to guild members as well. We are challenging every member to contribute to the overall quilt design by creating one block. You are certainly welcome to contribute as many as you’d like! Blocks for the quilt must finish at 5” or smaller and may use up to two colors from the color palette above. The background will be made up of only the White and Bone colors, while the main parts of the quilt will use the other five colors. 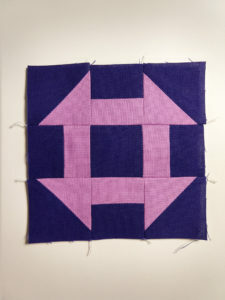 Blocks can be created using any method – EPP, traditional piecing, FPP, improv, ect. Fabric for these blocks will be made available starting at the August meeting, but you may also feel free to use your own fabric if you have these colors available. All blocks will need to be returned to Kristyn no later than the October meeting, so that we have time to assemble the top and get it quilted before the deadline. If you would like to make a block (or to return a completed block), but are not able to make a meeting or sew-in, please email Kristyn and we will try to make arrangements. More information to be discussed at the upcoming meetings!